We crossed some of the square Texas counties today. Each county is 30 miles on each side. The county seat is in the middle, so there is a town every 30 miles. Snyder was very grand including a courthouse square with a bronze very rare albino bison. 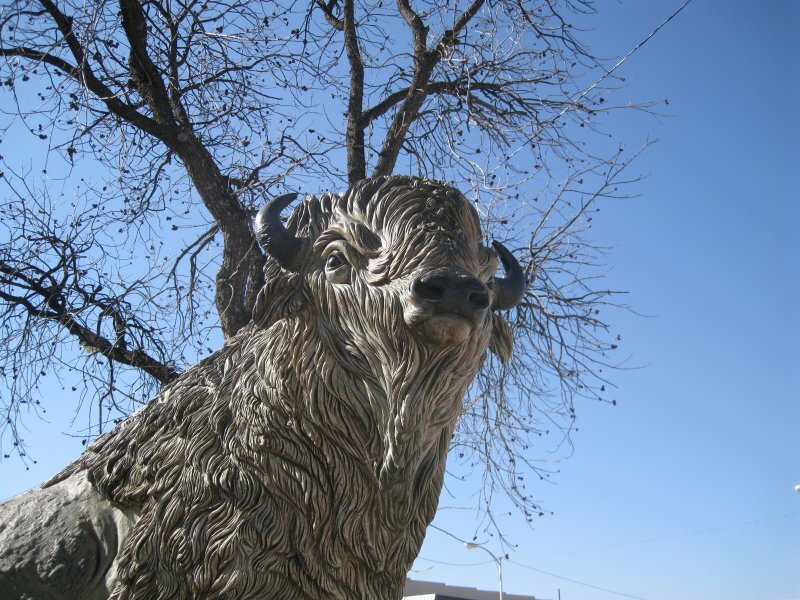 The purpose of the sculpture is to honor the man, J. Wright Mooar, who shot more bison (about 22,000) than anyone else. Another town, Gail, was very poor, with nothing recognizable as even a courthouse. Route US 180 runs parallel 30 miles south of US380 the road we took last year. US 180 is a better road and the areas we passed through more devoted to agriculture than scrub brush. Hobbs is not very exciting but the RV Park is good. We celebrated Chinese New Year at the Mi Won restaurant beside the RV Park. Setting up tomorrows route to Carlsbad Caverns, I couldn't get the GPS to find Carlsbad. Then I remembered in the last update Garmin couldn't get all the maps into the StreetPilot so they split the maps into two or three parts. To show Newfoundland I had to eliminate the western USA. It seems Carlsbad is off the map. I forgot to bring the DVD that had the map files on it so I had to order the 2010 version and am now trying to download over 2GB of map files.